Horse breeders are able to predict the coloring of foals with knowledge of the dominant and recessive genes that determine color. A horse has two copies of each gene. Recessive traits are only expressed if both copies of the gene are recessive. If one or both copies are dominant, the dominant trait is expressed. The dominant allele of gene W prevents pigmentation in the skin and hair. A horse with one dominant copy of gene W has white hair, brown or blue eyes and pink skin. Other horses have two copies of the recessive W gene. The W gene is lethal if both copies of the gene are dominant. Grey coloring is determined by the G gene. If a horse has one or two copies of the dominant G gene, it will be grey in color. Horses with this gene are not born grey, but their hair turns grey as they grow up. Unlike white horses, greys have pigmented skin. Horses that are not grey have two recessive copies of the G gene. Black hair is determined by two genes; A and E. Gene E determines whether the horse has black pigmentation in the hair. A horse with no black pigmentation has two recessive copies of gene E and is red in color. Red coloring includes chestnuts and sorrels and manes and tales are also a shade of red, but not black. Gene A determines how the black hair is distributed on the body. Uniformly black horses have two recessive copies of gene A. If a horse has one or two copies of the dominant A gene, the horse may have black points on the legs, mane and tail, but not a black coat on the body. Genes C and D dilute the horses' pigmentation to a lighter color. The C gene only dilutes red pigmentation and has no effect on black coloring. If a red horse has two dominant copies of this gene, the red pigment is not diluted. If a horse has one dominant and one recessive copy of the gene, color will be diluted. This results in bay horses becoming buckskins and red horses becoming palominos. Horses with two recessive copies of this gene are cremello, a pale cream color with blue eyes and pink skin. The D gene affects both red and black pigmentation, but does not affect coloring on the points of the horse. This gene is not present in all breeds. Horses with two recessive copies of the D gene become duns. This results in red horses diluting to red duns, bay horses to buckskin duns and black horses to mouse dun or grulla. Paint horses have the tobiano or TO gene. Horses with at least one dominant copy of this gene have a pattern of white hair that usually includes white legs, a dark head and a variable pattern on the body. 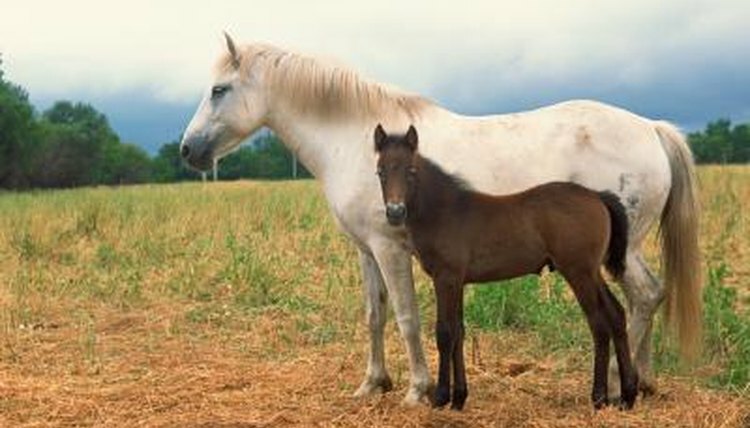 If a horse has two dominant copies of this gene, it will always produce foals that are spotted. The genes responsible for other white spots and patterns, including appaloosa and white markings, are still unknown. What Are Heterozygous & Homozygous Traits in Horses? What Causes Dappling in Horses' Coats? When Do Appaloosas Get Spots?